Cornea, Iris, and Lens | Microanatomy Web Atlas | Gwen V. Childs, Ph.D.
As you study your eye slide, move from the conjunctival fornix to the anterior region of the cornea. An overview of the cornea proper is shown below. 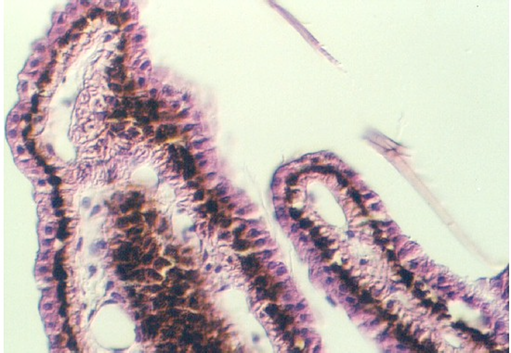 The thicker epithelium is facing anteriorly (left). (Therefore, the outside of the eye would be to the left.) 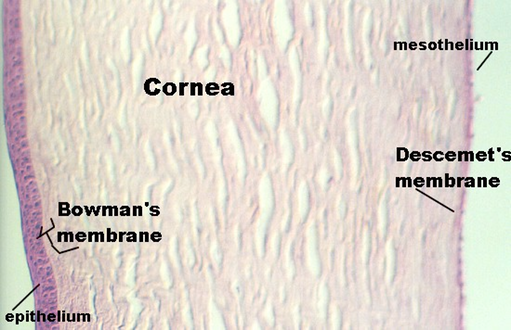 Underneath the epithelium is Bowman's membrane, which is a condensed region that begins the cornea proper. 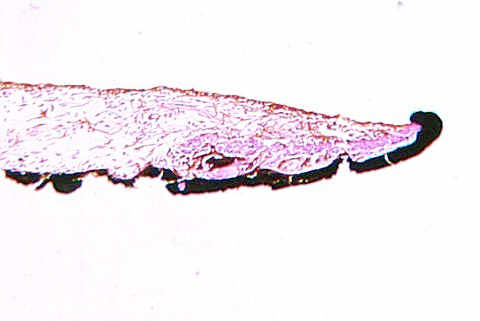 Finally Descemet's membrane lies at the opposite side, just underneath the mesothelium. The anterior chamber faces to the right. The following photograph shows these structures in greater detail. Compare it with Figures from your text. Move your slide into the anterior chamber. The first structure you may encounter on each side of the LENS is the IRIS. This is heavily pigmented along the surface facing the lens. Not all sections go through the pupil. 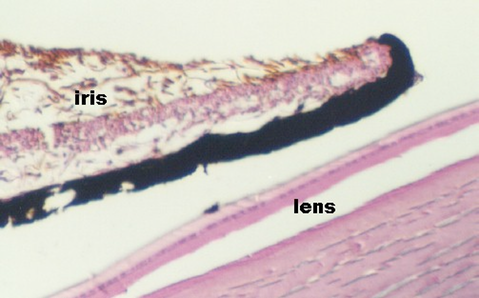 The following photographs show the iris and its relationship to the lens. In the photographs below, the center of the eye of the pupil is to the right. Inside the iris can be seen bundles of muscle (shown above). What type of muscle is in the Iris and what is its function? How is it innervated? The anterior surface of the lens faces the anterior chamber. The posterior surface faces the posterior chamber. The lens may be torn in your slides. 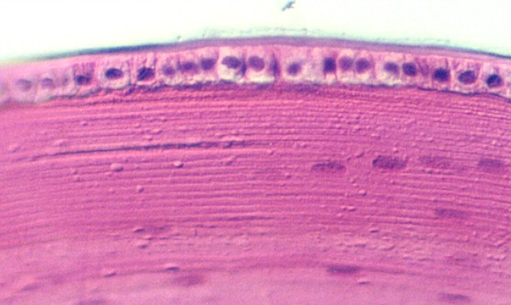 However, one can see lens epithelium immediately under the capsule. Also, if you focus up and down, you can see the equatorial arrangement of lens fiber nuclei. 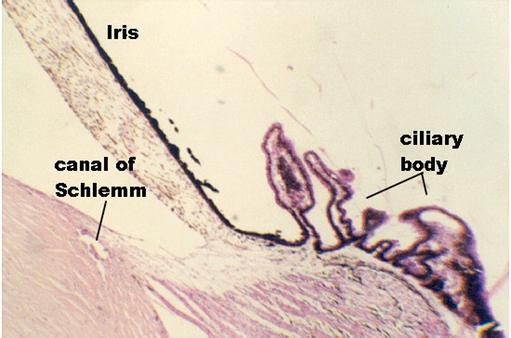 The following photograph shows the lens epithelium, the fibers, and the nuclei. Draw a diagram or electron micrograph of the lens fibers. Understand how they are arranged to allow light to pass through. What structures in the eye control the lens? Move to the angle or junction formed by the iris and the cornea. The following photograph shows this region. The cornea is in the lower left corner. The Iris is shown projecting across the photograph. To the right is the ciliary body. Using your text Figures as a guide, label the ANTERIOR CHAMBER and THE POSTERIOR CHAMBER in the following photograph. The Canal of Schlemm can be seen in the Cornea, above. It almost looks like a poorly defined hole in the connective tissue, rather than a well defined canal. What is its function? Also at the junction between the iris and the cornea, the CILIARY BODY can be seen. It is illustrated in the above photograph. Find an example on your slide 97. It has several processes with pigmented epithelium. Projecting from these processes are fibers called "zonule fibers" that connect with the lens. 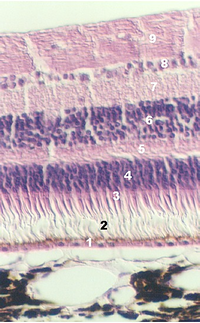 The following photographs illustrate the CILIARY PROCESSES and Zonule fibers. The Vitreous body fills the posterior chamber from the lens to the retina. It is a colorless, structureless, gel that is nearly 99% water. It can't be appreciated from your section on slide 97. Define the region where it lies. Interestingly, it contains cells at its periphery. What are the cells in the periphery of the vitreous body and what is their function?